OPRI’s collaboration with a unique global network of general practitioners and specialists places it in a unique position to be the research organisation of choice for the delivery of clinical trials in real-world settings. We work alongside experienced clinicians with access to real-life patients thus improving site effectiveness. In recognising the limitation of evidence solely derived from randomised controlled trials (RCTs) OPRI focuses on the use of pragmatic studies to support healthcare decisions and inform how a treatment may be applied by clinicians outside of the classical clinical trial environment. OPRI recognises that evaluating interventions in real life clinical practice can sometimes require groups of patients (GP practices) rather than individual patients to be randomised. 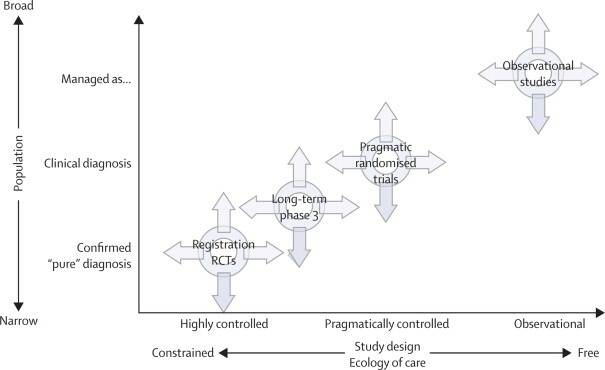 Cluster randomised controlled trials can be a practical and financially viable approach to evaluating interventions in a real world setting without high intensity patient level intervention and randomisation. These can be particularly useful when assessing patient factors such as adherence. Efficacy trials have long been the backbone of evidence-based research and a necessary component of drug licensing and the evaluation of short term efficacy, adverse events and safety. RCT’s seek to optimise conditions by using highly selected patient populations and close clinical monitoring to assess true cause and effect between an intervention and an outcome.